A complete list of my publications can be found below—click on the links to access a PDF of the article (hold cursor over link to see excerpt for some papers). These files require Adobe© Reader, which can be freely downloaded from Adobe—click on the image below. I can also send hard copies or reprints of any publication – please CONTACT me directly if you want any. Quisenberry, S. S., T. C. MacRae & T. R. Yonke. 1983. Preference of Forcipita loca (Homoptera: Cicadellidae) adults to forage plants. Environmental Entomology 12(4):1149–1153 [pdf]. MacRae, T. C. & T. R. Yonke. 1984. Life history of Forcipita loca (Homoptera: Cicadellidae) on three graminaceous hosts. Journal of the Kansas Entomological Society 51(1):69–78 [pdf]. Nelson, G. H. & T. C. MacRae. 1990. Additional notes on the biology and distribution of Buprestidae (Coleoptera) in North America, III. The Coleopterists Bulletin 44(3):349–354 [pdf]. MacRae, T. C. 1991. The Buprestidae (Coleoptera) of Missouri. Insecta Mundi 5(2):101–126 [pdf]. MacRae, T. C. 1994. Annotated checklist of the longhorned beetles (Coleoptera: Cerambycidae and Disteniidae) known to occur in Missouri. Insecta Mundi 7(4) (1993):223–252 [pdf]. Nelson, G. H. & T. C. MacRae. 1994. Oaxacanthaxia nigroaenea Nelson and MacRae, a new species from Mexico (Coleoptera: Buprestidae). The Coleopterists Bulletin 48(2):149–152 [pdf]. Nelson, G. H., R. L. Westcott & T. C. MacRae. 1996. Miscellaneous notes on Buprestidae and Schizopodidae occurring in the United States and Canada, including descriptions of previously unknown sexes of six Agrilus Curtis (Coleoptera). The Coleopterists Bulletin 50(2):183–191 [pdf]. MacRae, T. C. 2000. Review of the genus Purpuricenus Dejean (Coleoptera: Cerambycidae) in North America. The Pan-Pacific Entomologist 76(3):137–169 [pdf]. MacRae, T. C. & S. R. Penn. 2001. Additional records of adventive Onthophagus Latreille (Coleoptera: Scarabaeidae) in North America. The Coleopterists Bulletin 55(1):59–60 [pdf]. MacRae, T. C. 2001. Correction to holotype deposition of Purpuricenus linsleyi Chemsak (Coleoptera: Cerambycidae). The Pan-Pacific Entomologist 77(4):281 [pdf]. MacRae, T. C. & G. H. Nelson. 2003. Distributional and biological notes on Buprestidae (Coleoptera) in North and Central America and the West Indies, with validation of one species. The Coleopterists Bulletin 57(1):57–70 [pdf]. MacRae, T. C. 2003. Mastogenius guayllabambensis MacRae, a new species from Ecuador (Coleoptera: Buprestidae: Haplostethini). The Coleopterists Bulletin 57(2):149–153 [pdf]. Sakalian, V., T. C. MacRae, S. Bílý & A. Sundholm. 2003. Comments on the proposed conservation of usage of Acmaeodera Eschscholtz, 1829 and Acmaeoderella Cobos, 1955 (Insecta, Coleoptera) by designation of Buprestis cylindrica Fabricius, 1775 as the type species of Acmaeodera. Bulletin of Zoological Nomenclature 60(3):218 [pdf]. MacRae, T. C. 2003. Agrilus (s. str.) betulanigrae MacRae (Coleoptera: Buprestidae: Agrilini), a new species from North America, with comments on subgeneric placement and a key to the otiosus species-group in North America. Zootaxa 380:1–9 [pdf]. MacRae, T. C. 2004. Notes on host associations of Taphrocerus gracilis (Say) (Coleoptera: Buprestidae) and its life history in Missouri. The Coleopterists Bulletin 58(3):388–390 [pdf]. MacRae, T. C., M. E. Baur, B. J. Fitzpatrick, A.-G. Gao, J. C. Gamundi, L. A. Harrison, V. T. Kabuye, R. M. McPherson, J. A. Miklos, M. S. Paradise, A. S. Toedebusch & A. Viegas. 2005. Laboratory and field evaluations of transgenic soybean exhibiting high-dose expression of a synthetic Bacillus thuringiensis cry1A gene for control of Lepidoptera. Journal of Economic Entomology 98(2):577–587 [pdf]. Brown, C. R. & T. C. MacRae. 2005. Occurrence of Cicindela (Cicindelidia) trifasciata ascendens (Coleoptera: Cicindelidae) in Missouri. Cicindela 37(1–2):17–19 [pdf]. MacRae, T. C. 2006. Case 3302. Buprestis sexsignata Say, 1839 (Insecta, Coleoptera): proposed precedence of the specific name over those of Chrysobothris ignipes Gory & Laporte, 1838 and Chrysobothris germari Gory & Laporte, 1838. Bulletin of Zoological Nomenclature 63(1):36–38 [pdf, ICZN Ruling here]. MacRae, T. C. 2006. Distributional and biological notes on North American Buprestidae (Coleoptera), with comments on variation in Anthaxia (Haplanthaxia) viridicornis (Say) and A. (H.) viridfrons Gory. The Pan-Pacific Entomologist 82(2):166–199 [pdf]. Miklos, J. A., M. F. Alibhai, S. A. Bledig, D. C. Connor-Ward, A. Gao, B. A. Holmes, K. H. Kolacz, V. T. Kabuye, T. C. MacRae, M. S. Paradise, A. S. Toedebusch & L. A. Harrison. 2007. Characterization of soybean exhibiting high expression of a synthetic Bacillus thuringiensis cry1A transgene that confers a high degree of resistance to lepidopteran pests. Crop Science 47(1):148–157 [pdf]. MacRae, T. C., J. Rifkind, R. L. Westcott & P. Zabransky. 2007. Case 3335. Comments on the proposed fixation of the feminine gender of the genus Trachys Fabricius, 1801 (Insecta, Coleoptera) and the form of derivation of family-group names based on Trachys. Bulletin of Zoological Nomenclature 64(1):64–66 [pdf]. MacRae, T. C. & M. E. Rice. 2007. Distributional and biological observations on North American Cerambycidae (Coleoptera). The Coleopterists Bulletin 61(2):227–263 [pdf]. MacRae, T. C. 2007. Comment on the proposed precedence of Buprestis angustula Illiger, 1803 (Insecta, Coleoptera) over Buprestis pavida Fabricius, 1793. Bulletin of Zoological Nomenclature 64(4):261 [pdf]. McDowell, W. T. & T. C. MacRae. 2009. First record of Typocerus deceptus Knull, 1929 (Coleoptera: Cerambycidae) in Missouri, with notes on additional species from the state. The Pan-Pacific Entomologist 84(4) (2008):341-343 [pdf]. McPherson, R. M. & T. C. MacRae. 2009. Assessing lepidopteran abundance and crop injury in soybean lines exhibiting a sythetic Bacillus thuringiensis cry1A gene. Journal of Entomological Science 44(2):120–131 [pdf]. McPherson, R. M. & T. C. MacRae. 2009. Evaluation of transgenic soybean exhibiting high expression of a synthetic Bacillus thuringiensis cry1A transgene for suppressing lepidopteran population densities and crop injury. Journal of Economic Entomology 102(4):1640–1648 [pdf]. MacRae, T. C. 2009. The species of Purpuricenus Dejean (Coleoptera: Cerambycidae) occurring in Maryland. The Maryland Entomologist 5(1):5–10 [pdf]. Brown, C. R. & T. C. MacRae. 2011. Assessment of the conservation status of Habroscelimorpha circumpicta johnsonii (Fitch) in Missouri. CICINDELA 42(4) (2010):77–90 [pdf]. MacRae, T. C. & C. R. Brown. 2011. Distribution, seasonal occurrence and conservation status of Dromochorus pruinina (Casey) in Missouri. CICINDELA 43(1):1–13 [pdf]. MacRae, T. C. & C. R. Brown. 2011. Historical and contemporary occurrence of Cylindera (s. str.) celeripes (LeConte) (Coleoptera: Carabidae: Cicindelinae) and implications for its conservation. The Coleopterists Bulletin 65(3):230–241 [pdf]. Fothergill, K., C. B. Cross, K. V. Tindall, T. C. MacRae & C. R. Brown. 2011. Tetracha carolina L. (Coleoptera: Cicindelidae) associated with polypipe irrigation systems in southeastern Missouri agricultural lands. CICINDELA 43(3):45–58 [pdf]. MacRae, T. C., C. R. Brown & K. Fothergill. 2011. Distribution, seasonal occurrence and conservation status of Cylindera (s. str.) cursitans (LeConte) (Coleoptera: Cicindelidae) in Missouri. CICINDELA 43(3):59–74 [pdf]. MacRae, T. C. & R. L. Westcott. 2012. Nomenclatural history of Melanophila drummondi ab. nicolayi Obenberger, 1944 (Coleoptera: Buprestidae), a change of authorship and synonymy under Phaenops drummondi (Kirby 1837), and a new distribution record and summary of larval hosts for the species. The Pan-Pacific Entomologist 88(1):87–91 [pdf]. MacRae, T. C., L. G. Bezark & I. Swift. 2012. Notes on distribution and host plants of Cerambycidae (Coleoptera) from southern México. The Pan-Pacific Entomologist 88(2):173–184 [pdf]. Steury, B. W., T. C. MacRae & E. T. Oberg. 2012. Annotated list of the metallic wood-boring beetles (Insecta: Coleoptera: Buprestidae) of the George Washington Memorial Parkway, Fairfax County, Virginia. Banisteria 39:71–75 [pdf]. MacRae, T. C. 2012. Occurrence of Cicindelidia ocellata rectilatera (Chaudoir) (Coleoptera: Cicindelidae) in Arkansas. Cicindela 44(3/4):49–54 [pdf]. MacRae, T. C. & C. L. Bellamy. 2013. Two new species of Actenodes Dejean (Coleoptera: Buprestidae) from southern Mexico, with distributional and biological notes on Buprestidae from Mexico and Central America. The Pan-Pacific Entomologist 89(2):102–119 [pdf]. MacRae, T. C. & J. P. Basham. 2013. Distributional, biological, and nomenclatural notes on Buprestidae (Coleoptera) occurring in the U.S. and Canada. The Pan-Pacific Entomologist 89(3):125–142 [pdf]. MacRae, T. C. 2014. Acmaeodera chuckbellamyi MacRae (Coleoptera: Buprestidae: Acmaeoderini), a new species from Arizona, USA. The Coleopterists Bulletin 68(1):50–52 [pdf]. MacRae, T. C. & B. D. Heinold. 2014. First records of Ptilophorus wrightii (LeConte 1868) (Coleoptera: Ripiphoridae) in Colorado and Oklahoma, with observations of female behavior. The Pan-Pacific Entomologist 90(1):47–52 [pdf]. Steury, B. W. & T. C. MacRae. 2014.The longhorned beetles (Insecta: Coleoptera: Cerambycidae) of the George Washington Memorial Parkway. The Longhorned Beetles (Insecta: Coleoptera: Cerambycidae) of the George Washington Memorial Parkway. Banisteria 44:7–12 [pdf]. Johnson, C. W., T. C. MacRae, C. Brownie, W. Virgets III & J. D. Allison. 2015. Observations of Cerceris fumipennis (Hymenoptera: Crabronidae) phenology and variation in its buprestid prey in Louisiana. Florida Entomologist 98(4):1106–1113 [full text, pdf]. Scholtz, C. H. & T. C. MacRae. 2016. Melanophila unicolor Gory, 1841 (Buprestidae), the furnace beetle, in southern Africa. African Entomology 24:24(1):241–244 [pdf]. MacRae, T. C. 2016. Chrysobothris bimaculata (Coleoptera: Buprestidae), a new species from Jamaica, with a key to the genus in Jamaica. Acta Entomologica Musei Nationalis Pragae 56(1):29–33 [pdf]. Rice, M. E., F. Merickel & T. C. MacRae. 2017. The longhorned beetles (Coleoptera: Cerambycidae) of Idaho. The Coleopterists Bulletin 71(4):667–678 [pdf]. Carlton, C. E., T. C. MacRae, A. Tishechkin, V. L. Bayless & W. Johnson. 2018. Annotated checklist of the Buprestidae (Coleoptera) from Louisiana. The Coleopterists Bulletin 72(2):351–367 [pdf]. Bílý, S., M. G. Volkovitsh & T. C. MacRae. 2018. Case 3769 – Proposed use of the plenary power to declare the pamphlet “Procrustomachia” as an unavailable work. Bulletin of Zoological Nomenclature 75(31 December 2018):220–224. ISSN 2057-0570 (online) [pdf]. MacRae, T. C. & C. R. Brown. 2001. Missouri Tigers. Missouri Conservationist 62(6):14–19 [full text]. MacRae, T. C. 2004. A new beetle for Missouri—with a twist! Nature Notes, Journal of the Webster Groves Nature Study Society 76(4):1, 12–13 [pdf]. MacRae, T. C. 2004. Beetle bits: Hunting the elusive “hibiscus jewel beetle”. Nature Notes, Journal of the Webster Groves Nature Study Society 76(5):4–5 [pdf]. MacRae, T. C. 2004. Beetle bits: A day with tomorrow’s entomologists. Nature Notes, Journal of the Webster Groves Nature Study Society 76(6):4–5 [pdf]. MacRae, T. C. & C. R. Brown. 2004. Bugs and birds: A nexus in Texas. Nature Notes, Journal of the Webster Groves Nature Study Society 76(10):2–6 [pdf]. MacRae, T. C. & C. R. Brown. 2005. Bugs and birds: A nexus in Texas (part 2). Nature Notes, Journal of the Webster Groves Nature Study Society 77(10):4–10, 14 [pdf]. MacRae, T. C. & C. R. Brown. 2006. Bugs and birds: A nexus in Texas (part 3). Nature Notes, Journal of the Webster Groves Nature Study Society 78(1):13–15 [pdf]. MacRae, T. C. 2006. Beetle bits: The “beautiful tiger beetle”. Nature Notes, Journal of the Webster Groves Nature Study Society 78(4):9–12 [pdf]. Thoma, R. S. & T. C. MacRae. 2008. Tiger beetle hunting in Nebraska. Nature Notes, Journal of the Webster Groves Nature Study Society 80(1):4–6 [pdf]. MacRae, T. C. 2008. Dungers and chafers: A trip to South Africa. SCARABS 34:1-9 [pdf]. MacRae, T. C. 2008. Bugged on the Ozark Trail. The Trail Builder, Newsletter of the Ozark Trail Association Late Fall 2008:1-4 [pdf]. MacRae, T. C. 2009. Cicindela cursitans in Missouri. Nature Notes, Journal of the Webster Groves Nature Study Society 81(4):7–9 [pdf]. MacRae, T. C. 2009. A unique population of festive tiger beetlein southeastern Missouri. Nature Notes, Journal of the Webster Groves Nature Study Society 81(5):10–12 [pdf]. MacRae, T. C. 2009. Typocerus deceptus in Missouri. Nature Notes, Journal of the Webster Groves Nature Study Society 81 (6/7):3–5 [pdf]. MacRae, T. C. 2009. Revisiting the Swift Tiger Beetle. Nature Notes, Journal of the Webster Groves Nature Study Society 81 (8):13–16 [pdf]. MacRae, T. C. 2009. North America’s most beautiful longhorned beetle. Nature Notes, Journal of the Webster Groves Nature Study Society 81(9):8–12 [pdf]. MacRae, T. C. 2010. Sanctuary for the Betulaceae. Nature Notes, Journal of the Webster Groves Nature Study Society 82(1):7–12 [pdf]. MacRae, T. C. 2010. Sabatia angularis. Petal Pusher, Newsletter of the Missouri Native Plant Society 25(1):3 [pdf]. MacRae, T. C. 2010. Pickle Springs Natural Area. Nature Notes, Journal of the Webster Groves Nature Study Society 82(2):7-11 [pdf]. MacRae, T. C. 2010. Crystallofolia (“frost flowers”). Nature Notes, Journal of the Webster Groves Nature Study Society 82(3):10-12 [pdf]. MacRae, T. C. 2010. The “overlooked, needle-tailed, thick-headed fly”. Nature Notes, Journal of the Webster Groves Nature Study Society 82(3):13-14 [pdf]. MacRae, T. C. 2010. Hawn State Park—winter hiking at its finest. Nature Notes, Journal of the Webster Groves Nature Study Society 82(4):7-10 [pdf]. MacRae, T. C. 2010. Do you have “An Inordinate Fondness”? Nature Notes, Journal of the Webster Groves Nature Study Society 82(4):10-11 [pdf]. MacRae, T. C. 2010. Clubmoss along the Ozark Trail. Nature Notes, Journal of the Webster Groves Nature Study Society 82(5):9-11 [pdf]. MacRae, T. C. 2010. Ozark witch hazel along the Ozark Trail. Nature Notes, Journal of the Webster Groves Nature Study Society 82(5):11-12 [pdf]. MacRae, T. C. 2010. Ozark Trail – Marble Creek Section. Nature Notes, Journal of the Webster Groves Nature Study Society 82(6):10–14 [pdf]. MacRae, T. C. 2010. The marvelously cryptic Dicerca lurida. Nature Notes, Journal of the Webster Groves Nature Study Society 82(8):13–14 [pdf]. MacRae, T. C. 2010. Rejoicing the end of summer. Nature Notes, Journal of the Webster Groves Nature Study Society 82(8):14–15 [pdf]. MacRae, T. C. 2010. Jeepers Creepers, where’d ya get those multilayered retinae? Nature Notes, Journal of the Webster Groves Nature Study Society 82(9):11–12 [pdf]. MacRae, T. C. 2010. Are we loving our prairies/glades/woodlands to death? Nature Notes, Journal of the Webster Groves Nature Study Society 82(9):13–16 [pdf]. MacRae, T. C. 2010. Special Delivery. Nature Notes, Journal of the Webster Groves Nature Study Society 82(10):11-12 [pdf]. MacRae, T. C. 2010. Flaming the debate. Nature Notes, Journal of the Webster Groves Nature Study Society 82(10):13-15 [pdf]. MacRae, T. C. 2010. Eye of the turtle. Nature Notes, Journal of the Webster Groves Nature Study Society 83(1) (2011):14-15 [pdf]. MacRae, T. C. 2011. Desmocerus palliatus—elderberry borer. Nature Notes, Journal of the Webster Groves Nature Study Society 83(2):11-12 [pdf]. MacRae, T. C. 2011. North America’s largest stag beetle. Nature Notes, Journal of the Webster Groves Nature Study Society 83(2):12-13 [pdf]. MacRae, T. C. 2011. “Rush skeletonplant pea gall wasp.” Nature Notes, Journal of the Webster Groves Nature Study Society 83(3):13-14 [pdf]. MacRae, T. C. 2011. Is Missouri’s disjunct population of Johnson’s tiger beetle extirpated? Nature Notes, Journal of the Webster Groves Nature Study Society 83(4):12–14 [pdf]. MacRae, T. C. 2011. Two things I love about fall. Nature Notes, Journal of the Webster Groves Nature Study Society 83(3):15–16 [pdf]. MacRae, T. C. 2011. Isn’t she splendid?! Nature Notes, Journal of the Webster Groves Nature Study Society 84(1) :8–9 [pdf]. MacRae, T. C. 2012. Different jaws for different jobs. Nature Notes, Journal of the Webster Groves Nature Study Society 84(2):12–13 [pdf]. MacRae, T. C. 2012. Oedipodine Rex. Nature Notes, Journal of the Webster Groves Nature Study Society 84(4):12–14 [pdf]. MacRae, T. C. 2012. Grampus and go-devil. Nature Notes, Journal of the Webster Groves Nature Study Society 84(4):14 [pdf]. MacRae, T. C. 2012. Swift Tiger Beetle: species on the brink. Nature Notes, Journal of the Webster Groves Nature Study Society 84(5):10–12 [pdf]. MacRae, T. C. 2012. Friday Flower: Phacelia purshii. Nature Notes, Journal of the Webster Groves Nature Study Society 84(6):12–13 [pdf]. MacRae, T. C. 2012. Tiger Beetles in southeast Missouri. Nature Notes, Journal of the Webster Groves Nature Study Society 84(6):13–15 [pdf]. MacRae, T. C. 2012. Dicerca pugionata—safe and sound! Nature Notes, Journal of the Webster Groves Nature Study Society 84(8):15–16 [pdf]. MacRae, T. C. 2012. Upside down bee fly. Nature Notes, Journal of the Webster Groves Nature Study Society 84(8):16–17 [pdf]. MacRae, T. C. 2012. Beetle botanists. Nature Notes, Journal of the Webster Groves Nature Study Society 84(9):13–14 [pdf]. MacRae, T. C. 2012. A classic fall ‘bycid. Nature Notes, Journal of the Webster Groves Nature Study Society 84(9):14–15 [pdf]. MacRae, T. C. 2012. Ghosts in the night. Nature Notes, Journal of the Webster Groves Nature Study Society 84(10):9–11 [pdf]. MacRae, T. C. 2013. Seasonal Beneficial: Praying Mantis. Wilder Quarterly Winter:16–17 [preview]. MacRae, T. C. 2013. Life at 8X: hibiscus flea beetle. Nature Notes, Journal of the Webster Groves Nature Study Society 85(1):11–13 [pdf]. MacRae, T. C. 2013. Dainty, delicate, little fairies. Nature Notes, Journal of the Webster Groves Nature Study Society 85(2):13–14 [pdf]. MacRae, T. C. 2013. Backyard gems. Nature Notes, Journal of the Webster Groves Nature Study Society 85(5):12–15 [pdf]. MacRae, T. C. 2013. My favorite of Missouri’s milkweeds. Nature Notes, Journal of the Webster Groves Nature Study Society 85(6):10–11 [pdf]. MacRae, T. C. 2013. Agrilus fuscipennis on persimmon. Nature Notes, Journal of the Webster Groves Nature Study Society 85(8):13–15 [pdf]. MacRae, T. C. 2013. It’s a Mayfly…It’s a Moth…It’s Thyridopteryx! Nature Notes, Journal of the Webster Groves Nature Study Society 85(10):14–16 [pdf]. MacRae, T. C. 2014. A winter longhorned beetle. Nature Notes, Journal of the Webster Groves Nature Study Society 86(1):13–14 [pdf]. MacRae, T. C. 2014. I’m a fun guy. Nature Notes, Journal of the Webster Groves Nature Study Society 86(2):14–15 [pdf]. MacRae, T. C. 2014. Pop! goes the beetle. Nature Notes, Journal of the Webster Groves Nature Study Society 86(5):11–12. [pdf]. MacRae, T. C. 2014. When is a stag beetle not a stag beetle? Nature Notes, Journal of the Webster Groves Nature Study Society 86(8):7–9. [pdf]. MacRae, T. C. 2014. Amorpha borer on goldenrod. Nature Notes, Journal of the Webster Groves Nature Study Society 86(9):11–12. [pdf]. MacRae, T. C. 2014. Orange and black on yellow. Nature Notes, Journal of the Webster Groves Nature Study Society 86(9):12–13. [pdf]. MacRae, T. C. 2014. North America’s most beautiful Agrilus jewel beetle. Nature Notes, Journal of the Webster Groves Nature Study Society 86(10):12–13. [pdf]. MacRae, T. C. 2015. Not quite adult. Nature Notes, Journal of the Webster Groves Nature Study Society 87(1):10–11 [pdf]. MacRae, T. C. 2015. Missouri’s largest planthopper. Nature Notes, Journal of the Webster Groves Nature Study Society 87(1):11–12 [pdf]. MacRae, T. C. 2015. Scorching plains, screaming cactus. Nature Notes, Journal of the Webster Groves Nature Study Society 87(3):7–9 [pdf]. MacRae, T. C. 2015. Stag and “stagette” beetle. Nature Notes, Journal of the Webster Groves Nature Study Society 87(6):10–11 [pdf]. MacRae, T. C. 2015. What’s black & white & red all over? Nature Notes, Journal of the Webster Groves Nature Study Society 87(6):11–13 [pdf]. MacRae, T. C. 2015. Multiple Megarhyssa males. Nature Notes, Journal of the Webster Groves Nature Study Society 87(6):13–14 [pdf]. MacRae, T. C. 2015. The role of Missouri’s natural areas and other conservation lands in preserving tiger beetle diversity. Missouri Natural Areas Newsletter 15(1):4–7 [pdf]. MacRae, T. C. 2016. Flower ants? Check again! Nature Notes, Journal of the Webster Groves Nature Study Society 88(4):10–12 [pdf]. MacRae, T. C. 2016. North America’s most recognizable longhorned beetle. Nature Notes, Journal of the Webster Groves Nature Study Society 88(5):10-11 [pdf]. MacRae, T. C. 2016. Fermenting bait traps for collecting longhorned beetles. Nature Notes, Journal of the Webster Groves Nature Study Society 88(5):11-15 [pdf]. MacRae, T. C. 2017. Why is this male carrion beetle “biting” the female’s antennae? Nature Notes, Journal of the Webster Groves Nature Study Society 89(6):15–16 [pdf]. MacRae, T. C. 2018. Crypsis? Mimicry? “Crypsimicry”? Nature Notes, Journal of the Webster Groves Nature Study Society 90(2):15–16 [pdf]. MacRae, T. C. 2018. Hamamelis vernalis (Ozark Witch Hazel)—a pollination paradox. Petal Pusher, Newsletter of the Missouri Native Plant Society33(5):1–3 [pdf]. MacRae, T. C. 2019. A superb southwestern Missouri cicada. Nature Notes, Journal of the Webster Groves Nature Study Society 91(1):15–16 [pdf]. MacRae, T. C. 2004. Review of: An Illustrated Summary of the Higher Classification of the Superfamily Buprestoidea (Coleoptera) by C. L. Bellamy, Folia Heyrovskyana, Supplementum 10, 197 pp. (2003). The Coleopterists Bulletin 58(1):47–48 [pdf]. MacRae, T. C. 2004. Review of: Coleotteri Bupresidi ‘dItalia, by G. Curletti, M. Rastelli, S. Rastelli, and F. Tassi, Piccole Fauna, Museo Civico di Storia Naturale di Carmagnola (Torino), Progetto Biodiversità (Roma), CD-ROM (2003). The Coleopterists Bulletin 58(3):391-392 [pdf]. MacRae, T. C. 2009. Book review: Review of the genera Calodema and Metaxymorpha (Coleoptera: Buprestidae), by U. Nylander, Folia Heyrovskyana, Supplementum 13, 84 pp., 44 color plates (2008). The Pan-Pacific Entomologist, 85(1):26-28 [pdf]. MacRae, T. C. 2010. Book review: A Treatise on the Western Hemisphere Caraboidea (Coleoptera). Their classification, distributions, and ways of life. Volume II (Carabidae-Nebriiformes 2-Cicindelitae), by T. L. Erwin and D. L. Pearson, Pensoft Series Faunistica 84, 365 pp, 33 color plate (2008). The Pan-Pacific Entomologist 85(4) (2009):199-201 [pdf]. Walters, G. C., Jr., R. L. Westcott, S. G. Wellso, J. M. Cicero, T. C. MacRae & C. L. Bellamy. 2006. Gayle H. Nelson (1926-2005): biography and memories, taxa and publications. The Pan-Pacific Entomologist 82(2):116–135 [pdf]. MacRae, T. C. 2012. In memorium: Richard L. Penrose (1943–2011). The Pan-Pacific Entomologist 88(2):i [pdf]. Westcott, R. L., S. Bílý, A. R. Cline, S. D. Gaimari, H. Hespenheide, T. C. MacRae, M. G. Volkovitsh, S. G. Wellso & G. Williams. 2014. In memoriam: Charles Lawrence Bellamy (1951–2013). The Coleopterists Bulletin 68(1):1–13 [pdf]. MacRae, T. C. 2011. Letter from the new Managing Editor. The Pan-Pacific Entomologist 87(1):70 [pdf]. MacRae, T. C. 2012. Letter from the Managing Editor. The Pan-Pacific Entomologist 88(1):103–104 [pdf]. MacRae, T. C. 2012. Letter from the Managing Editor. The Pan-Pacific Entomologist 88(4):437–438 [pdf]. MacRae, T. C. 2013. Letter from the Managing Editor. The Pan-Pacific Entomologist 89(4):267–268 [pdf]. MacRae, T. C. 2014. Letter from the Managing Editor. The Pan-Pacific Entomologist 90(4):231–232 [pdf]. MacRae, T. C. 2015. Charles D. Michener: 80 years of scientific publication. The Pan-Pacific Entomologist 91(2):207–209 [pdf]. MacRae, T. C. 2015. President’s Corner. Nature Notes, Journal of the Webster Groves Nature Study Society 87(10):1–2 [pdf]. MacRae, T. C. 2016. Letter from the Managing Editor. The Pan-Pacific Entomologist 91(4) :356 [pdf]. MacRae, T. C. 2016. President’s Corner. Nature Notes, Journal of the Webster Groves Nature Study Society 88(1):1–2 [pdf]. MacRae, T. C. 2016. President’s Corner. Nature Notes, Journal of the Webster Groves Nature Study Society 88(5):1–2 [pdf]. MacRae, T. C. 2016. President’s Corner. Nature Notes, Journal of the Webster Groves Nature Study Society 88(8):1–2 [pdf]. MacRae, T. C. 2016. Letter from the Managing Editor. The Pan-Pacific Entomologist 92(4):217–218 [pdf]. MacRae, T. C. 2017. Letter from the Managing Editor. The Pan-Pacific Entomologist 93(4):239–240 [pdf]. MacRae, T. C. 2019. Letter from the Managing Editor. The Pan-Pacific Entomologist 94(4) :251–252 [pdf]. Gamundi, J. C., A. M. Molinari, E. J. Pochettino, S. Riart, S. M. Zampierin & T. C. MacRae. 2001. Geographic variation in susceptibility of Rachiplusia nu (Lepidoptera: Noctuidae) to Bacillus thuringiensis toxin Cry1Ac in Argentina. Entomological Society of America, San Diego, California, December 9-12, 2001 [program listing]. MacRae, T. C. & C. R. Brown. 2001. A survey of Missouri tiger beetles (Coleoptera: Cicindelidae). Entomological Society of America, San Diego, California, December 9-12, 2001 [abstract]. MacRae, T. C., C. R. Brown & K. Fothergill. 2010. Cylindera cursitans: Distribution and Seasonal Occurrence in Southeast Missouri. Entomological Society of America, San Diego, California, 12–15 December 2010 [abstract, pdf]. MacRae, T. C., T. L. Clark, T. Galvan, S. Martinelli, D. Stojsin & X. Ye. 2012. MON 87701 Soybean expresses near-high dose of Cry1Ac against two important lepidopteran pests. Entomological Society of America, Knoxville, Tennessee, 15 November 2012 [program listing]. Carlton, C. E., W. Johnson, J. D. Allison, T. C. MacRae, A. Tishechkin, W. Virgets, M. Ferro, & J.-S. Park. 2014. Buprestidae of Louisiana: from traditional faunistics to early detection of the Emerald Ash Borer. Entomological Society of America, Portland, Oregon, 19 November 2014 [program listing, pdf]. Gamundi, J. C., S. M. Riart, T. C. MacRae & S. Zampierin. 2004. Geographic variation in susceptibility of Epinotia aporema (Lepidoptera: Olethreutidae) and Rachiplusia nu (Lepidoptera: Noctuidae) to Bacillus thuringiensis toxin Cry1Ac in Argentina. In: Proceedings of the VII World Soybean Research Congress, March 1–6, 2004, Iguassu Falls, Brazil. Tetracha carolina (Coleoptera: Cicindelidae), cover. Cicindela 43(3) (September 2011) [pdf]. Hemidactylus mabouia (Reptilia: Squamata), cover & pg. 182, fig. 1, In: K. H. Short & K. Petren, Multimodal dispersal during the range expansion of the tropical house gecko Hemidactylus mabouia. Ecology & Evolution 1(2):181–190 (October 2011) [online, pdf]. Cicindelidia floridana (Coleoptera: Cicindelidae), cover. Cicindela 43(4) (December 2011) [pdf]. Cicindela arenicola (Coleoptera: Cicindelidae), cover. Cicindela 44(1) (March 2012) [pdf]. Buprestis rufipes (Coleoptera: Buprestidae), cover. In: S. M. Paiero, M. D. Jackson, A. Jewiss-Gaines, T. Kimoto, B. D. Gill & S. A. Marshall, Field Guide to the Jewel Beetles (Coleoptera: Buprestidae) of Northeastern North America (2012). Canadian Food Inspection Agency and University of Guelph Insect Collection, Canada, 411 pp. [description, pdf]. Aphis glycines (Hemiptera: Aphididae), cover. Molecular Plant-Microbe Interactions 26(1) (January 2013) [online, pdf]. Eurhinus cf. adonis (Coleoptera: Cicindelidae), cover. The Coleopterists Bulletin 67(2) (June 2013) [pdf]. Chrysobothris octocola (Coleoptera: Buprestidae), cover, The Coleopterists Bulletin 67(3) (September 2013) [pdf]. Cicindela limbalis (Coleoptera: Cicindelidae), pg. 69. In: A. V. Evans, Beetles of Eastern North America (2014). Princeton University Press, Princeton, New Jersey, 560 pp. [description]. Elytrimitatrix undata (Coleoptera: Disteniidae), pg. 387. Ibid. Plinthocoelium suaveolens suaveolens (Coleoptera: Cerambycidae), pg. 404. Ibid. Eurhinus cf. adonis (Coleoptera: Curculionidae), pg. 96. In: Featured Insect, American Entomologist 60(2) (Summer 2014) [pdf]. Perisphaerus sp. (Blattodea: Blaberidae), pg. 96 (3 photos). In: D. Rentz, A Guide to the Cockroaches of Australia (2014). CSIRO Publishing, Collingwood, Victoria, Australia, 318 pp. [description]. Agrilus fuscipennis (Coleoptera: Buprestidae), pg. 4, fig. 1B. In: A. M. Evans, D. D. McKenna, C. L. Bellamy & B. D. Farrell, Large-scale molecular phylogeny of metallic wood-boring beetles (Coleoptera: Buprestoidea) provides new insights into relationships and reveals multiple evolutionary origins of the larval leaf-mining habit. Systematic Entomology, DOI: 10.1111/syen.12108 (27 October 2014) [pdf]. Acmaeodera macra (Coleoptera: Buprestidae), pg. 4, fig. 1D. Ibid. Crossidius coralinus fulgidus (Coleoptera: Buprestidae), cover. The Coleopterists Bulletin 69(1) (18 March 2015) [pdf]. Cicindelidia politula politula (Coleoptera: Cicindelidae), pl. 26.1, In: D. L. Pearson, C. B. Knisley, D. P. Duran & C. J. Kazilek, A Field Guide to the Tiger Beetles of the United States and Canada: Identification, Natural History, and Distribution of the Cicindelinae (2015). Oxford University Press, New York, 251 pp., 33 color plates [description]. Cicindela arenicola (Coleoptera: Cicindelidae), pl. 26.2. Ibid. Cicindelidia obsoleta vulturina (Coleoptera: Cicindelidae), pl. 29.1. Ibid. Ellipsoptera marginata (Coleoptera: Cicindelidae), pl. 32. Ibid. Parandra polita (Coleoptera: Cerambycidae), fig. 1A. In: S. Haddad & D. D. McKenna, Phylogeny and evolution of the superfamily Chrysomeloidea (Coleoptera: Cucujiformia). Systematic Entomology, DOI: 10.1111/syen.12179 (16 May 2016) [pdf]. Linsleya convexa (Coleoptera: Meloidae), cover. The Coleopterists Bulletin 70(2) (18 June 2016) [pdf]. Panorpa helena (Mecoptera: Panorpidae). In: D. J. Stevenson, Natural Georgia: In search of scorpionflies in rural Georgia. Savannah Now, Savannah Morning News (26 November 2017) [article]. Moneilema armatum (Coleoptera: Cerambycidae), cover. 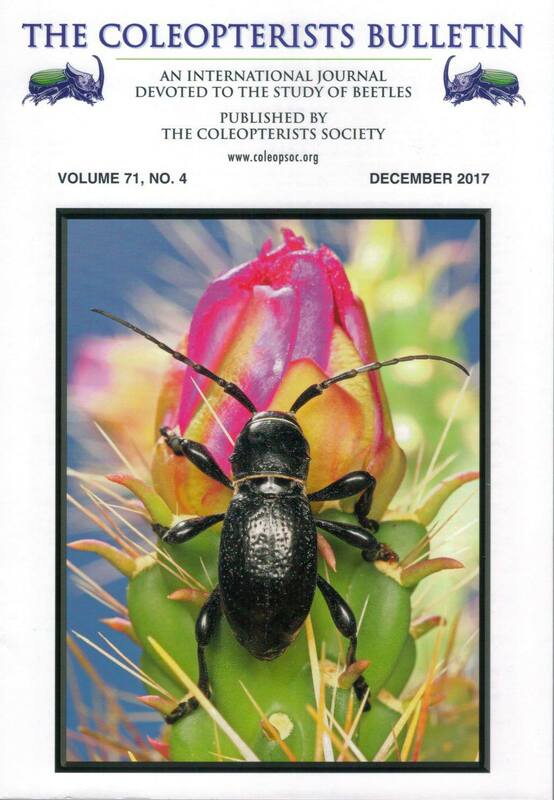 The Coleopterists Bulletin 71(4) (31 Dec 2017) [image]. “Clearwing Moth Wood Borers Encountered in Missouri Nurseries”. Missouri Association of Nurserymen, Cape Girardeau, Missouri, 13 June 1987. “Effect of Artificial Diet Composition on Growth and Survival of Beet Armyworm”. Entomological Society of America, Formal Conference: Insect Rearing, Reno Convention Center, Reno, Nevada, 10 December 1991. “Insect Research at Novo Nordisk Entotech, Inc”. University of California Davis Biotechnology Retreat, St. Helena, California, 27 February 1993. “Arthropod Rearing and Allergy: A Professional Hazard”. Entomological Society of America, Symposium: Allergy and Immune Disorders Induced by Arthropods, Indianapolis, Indiana, 13 December 1993 [absentee presentation]. “Bugs & Bones: A Natural History Tour through South Africa”. Webster Groves Nature Study Society, St. Louis Public Library, Frontenac, Missouri, 14 April 2000. “Potential Value of Bt in Soybean Host-Plant Resistance”. Soybean Breeders/Entomologists Workshop, Westport Plaza, St. Louis, Missouri, 14 February 2006. Plenary Speaker. “Bugs & Bones: A Natural History Tour through South Africa”. San Juan College, Farmington, New Mexico, 24 February 2006. “From Hilltops to Swamps: Insects in Missouri’s Rarest Prairies”. Illinois Butterfly Monitoring Network Annual Workshop, Gail Borden Public Library, Elgin, Illinois, 7 March 2009. “Recognition of Wood Boring Insects in Missouri Nurseries… and Beyond”. Horticulture Inspector Society, Innsbrook Conference Center, Innsbrook, Missouri, 19 October 2010. “The Bizarre and the Beautiful: Bugs from Brazil and Beyond”. Webster Groves Nature Study Society, Powder Valley Nature Conservation Center, Kirkwood, Missouri, 1 November 2011. “Nine Days, Ten States, 4,300 Miles: My Peripatetic Quest for North America’s Rarest Tiger Beetles”. Webster Groves Nature Study Society, Entomology Group, Butterfly House, Chesterfield, Missouri 23 January 2012 [pdf]. “Intacta RR2 Pro: La Primera Tecnología Desarrollada Exclusivamente Para Sudamérica”. Monsanto Latin America South Producer Technical Conference, Salta, Argentina, 26 March 2012 [in Spanish]. “Intacta RR2 Pro: La Primera Tecnología Desarrollada Exclusivamente Para Sudamérica”. Monsanto Latin America South Producer Technical Conference, San Miguel de Tucumán, Argentina, 26 March 2012 [in Spanish]. “Intacta RR2 Pro: La Primera Tecnología Desarrollada Exclusivamente Para Sudamérica”. Monsanto Latin America South Producer Technical Conference, La Banda, Argentina, 27 March 2012 [in Spanish]. “Intacta RR2 Pro: La Primera Tecnología Desarrollada Exclusivamente Para Sudamérica”. Monsanto Latin America South Producer Technical Conference, Saenz Peña, Argentina, 28 March 2012 [in Spanish]. “Tiger Beetles of Missouri”. Miramiguoa Master Naturalists, Valley Park, Missouri, May 2012 [pdf]. “Approaching the Unapproachable: Tips and Tricks for Photographing Live Insects in Their Native Habitats”. Entomological Society of America, Symposium: Entomologists Beyond Borders: Hands on Macrophotography to Help Think Globally, Knoxville Convention Center, Knoxville, Tennessee, 13 November 2012 [program listing]. “Fossil Insects of the Green River Formation: A Case Study”. Eastern Missouri Paleontological Society, Washington University, St. Louis, Missouri, 12 April 2013. “Insect Photography: It’s Not That Hard!”. Webster Groves Nature Study Society, Entomology Group, Butterfly House, Chesterfield, Missouri, 15 April 2013. “Approaching the Unapproachable: Tips and Tricks for Photographing Live Insects in Their Native Habitats”. Missouri Nature and Environmental Photographers Society, Powder Valley Nature Conservation Center, Kirkwood, Missouri, 21 May 2013 [recap]. “Approaching the Unapproachable: Tips and Tricks for Field Photography of Wary Insects”. Entomological Society of America [webinar], 8 August 2013. “Approaching the Unapproachable: Tips and Tricks for Field Photography of Wary Insects”. Entomological Society of America [webinar], 22 August 2013 [video]. “Tiger Beetles of Missouri: Distribution, habitat preferences, seasonal occurrence, and comments on species of conservation concern”. Illinois Natural History Survey, Fall Seminar Series, Champaign, Illinois, 29 October 2013 [abstract]. “Tigers in My Backyard: An Introduction to Missouri’s Tiger Beetles and Their Conservation”. Day of Insects, Reiman Gardens, Iowa State University, Ames, 29 March 2014 [program]. “Natural History of Oklahoma’s Glass Mountains, with Emphasis on Insects”. Webster Groves Nature Study Society, Entomology Group, Butterfly House, Chesterfield, Missouri, 21 April 2014 [pdf]. “Next Generation Transgenic IR Products in Soybeans”. Entomological Society of America, Member Symposium: Transgenic Insect Resistant Soybeans, Portland Convention Center, Portland, Oregon, 19 November 2014 [abstract]. “From Hilltops to Swamps: Insects in Missouri’s Rarest Prairies”. Missouri Master Naturalists, Confluence Chapter, Busch Conservation Area, Weldon Spring, Missouri, 9 December 2014 [pdf]. “2nd Generation Transgenic Insect Protected Soybean”. 2015 Soybean Breeders Workshop: Entomology and Agronomy; SESSION I: Lepidoptera: A Metamorphosis in Management Strategies?, Wesport Plaza, St. Louis, Missouri, 17 February 2015 [also Session Chair]. “Antlions & tiger beetles & woolly bears, oh my! A local entomologist’s look at some of Missouri’s more interesting insects”. University of Guelph, Entomology class field trip, Reis Biological Station, Steelville, Missouri, 30 April 2015 [pdf]. “Insects of 2015”. Webster Groves Nature Study Society, Entomology Group, Butterfly House, Chesterfield, Missouri, 21 September 2015. “Flash Lighting Techniques for Close-up and Macrophotography”. Missouri Nature & Environmental Photographers, Ethical Society of St. Louis, Clayton, Missouri, 20 October 2015 [review]. “Creating Insect Protected Crops through Biotechnology”. Lewis & Clark Community College, Godfrey, Illinois, 2 December 2015. “IB468 Classification & Evolution of Insects: Coleoptera & Strepsiptera” (Guest Lecturer). University of Illinois, Urbana-Champaign, 7 December 2015. “Classification & Evolution of Coleoptera & Strepsiptera”. Webster Groves Nature Study Society, Entomology Group meeting, Butterfly House, Chesterfield, Missouri, 17 April 2016. “2016 Summer Insect Collecting “iReport””. Webster Groves Nature Study Society, Entomology Group, Butterfly House, Chesterfield, Missouri, 19 September 2016. “IRM value and potential for protein interaction in Bt soybean pyramids”. International Congress of Entomology, Contributed Papers: Ecology of Pesticides, Resistance, Toxicology, and Genetically Modified Crops, Orlando Convention Center, Orlando, Florida, 30 September 2016 [abstract]. “Tigers in My Backyard: An Introduction to Missouri’s Tiger Beetles and Their Conservation”. Webster Groves Nature Study Society, Entomology Group, Butterfly House, Chesterfield, Missouri, 21 November 2016. “Flash Lighting Techniques for Nature Photography”. Webster Groves Nature Study Society, Nature Photography Group, Powder Valley Conservation Nature Center, Kirkwood, Missouri, 7 March 2017. “Insect Macrophotography” (Guest Lecturer). Missouri Botanical Garden Photography Series, Shaw Nature Reserve, Gray Summit, Missouri, 9 Sep 2017. “Insects of 2017: An iPhone Diary”. Webster Groves Nature Study Society, Entomology Group, Butterfly House, Chesterfield, Missouri, 18 September 2017. “Antlions & Tiger Beetles & Woolly Bears, Oh My! A Local Entomologist’s Look at Some of Missouri’s More Interesting Insects”. Webster Groves Nature Study Society, Entomology Group, Butterfly House, Chesterfield, Missouri, 20 November 2017 [event]. “Insects (mostly) of 2018: An iPhone Diary”. Webster Groves Nature Study Society, Entomology Group, Butterfly House, Chesterfield, Missouri, 17 December 2018. “Highlights from Nearly 20 Years of Chasing Tiger Beetles in Missouri”. Webster Groves Nature Study Society, Entomology Group, Shaw Nature Reserve, Gray Summit, Missouri, 21 January 2019 [pdf]. “The Botanists Among Us: Host Plant Specialization in Insects”. Missouri Native Society, St. Louis Chapter, Sunset Hills Community Center, Sunset Hills, Missouri, 23 January 2019 [pdf]. In addition to the above, innumerable presentations on science and entomology at local parks, elementary, middle and high schools, and community events.